The Puranas (holy texts of Hindus) mentions the origin of Kumbh Mela. The Ksheer Sagar (Ocean of Milk) was churned (Samudra Manthan) by Devas (Gods) and Asuras (Demons). The Meru Mountain was used as a churning rod and the serpent Vasuki was used for rope. Out of the churning came out Amrit (nectar of immortality). Both Devas and Asuras wanted the amrit and there was 12 days of struggle. During the struggle few drops of nectar fell on four places on Earth and those places are celebrated during Kumbh Mela. As 1 day of the divine means 12 years of human, the Kumbh festival is held every 12 years. Every Kumbh Mela, the astronomical positions are similar to the situations which led to Samudra Manthan and the falling of nectar at four places on earth. During the festival the same cosmic energy is felt in the waters therefore all devotees gather for a dip in the holy waters. The waters are so divine that they are said to purify sins of the people and their ancestors. Hymns are chanted, people pray at the bathing ghats and charity is done. 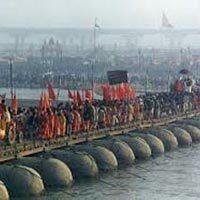 Kumbh is the world largest and holiest pilgrimage. Ujjain is one of the holiest cities according to Hindu mythology. The city of Mahakal, the Lord of all times, the city is a holy pilgrimage. Ujjain has been named and praised in various other names in Hindu texts and scriptures. Almost 84 forms of Lord Shiva are worshipped here. Shri Mahakaleshwar Temple, Shri Kaal Bhairav Temple, Shri Chintaman Ganesh Temple, Harsiddhi Temple, Shri Siddhwat Temple are some of the most revered places. 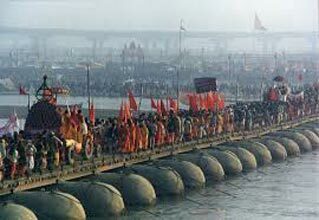 The Simhastha Kumbh Mahaparv is special in Ujjain as it is the seat of divine Mahakal, who made the Manthan possible after having consumed the deadly poison (halahal) which came out of the churning.